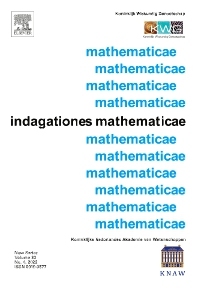 Indagationes Mathematicae is a peer-reviewed international journal for the Mathematical Sciences of the Royal Dutch Mathematical Society. The journal aims at the publication of original mathematical research papers of high quality and of interest to a large segment of the mathematics community. The journal also welcomes the submission of review papers of high quality. Papers can be submitted via the Elsevier Editorial System. In order to enhance accessibility to the research published in Indagationes, only papers which have been uploaded to the ArXiv will be considered.